The idea of a layered security strategy was born out of the knowledge that a single security solution or system cannot realistically stop all intrusion attempts. Assuming that we know the first layer will be overcome, the idea is that this layer will raise the alarm as soon as an intrusion is attempted, while also deterring and delaying the intruders long enough for a response team to arrive. Of course, that isn’t always the case, and we therefore hopefully have other layers to do the same until the intruders can be apprehended, chased away, or simply give up because continuing is simply too much trouble. While there are many layers and solutions one can use in a residential estate, defending your perimeter is generally the first line of defence and there are many solutions available to help with this task, from your traditional walls and fences (preferably electrified and zoned), motion or vibration sensors, under-dig technologies and so forth. Over the last few years, surveillance cameras have also been deployed as a perimeter defence in order to give the responders an idea of what they are up against, where they are and to catch false alarms (like animals wandering around) before resources are deployed. Video analytics added more value to the cameras, with some analytics able to identify non-human intruders and avoid raising the alarm at all. When thermal cameras were released to the public, despite their cost, they were added to the perimeter defence toolbox due to their ability to capture images irrespective of light and many other weather conditions. Again, analytics has improved the value of thermals and the reduction in pricing has seen these systems appearing on more estates’ perimeters. Unfortunately, while being able to see someone as they break in via your perimeter, may not be enough. If you can be sure of catching them before they move on, then all’s well. However, the chance of doing that is fairly limited and given the size of some estates, it is easy for them to vanish into the estate quickly once on the property. Surveillance cameras offer a solution to this as well, assuming you can supplement your system with PTZ (pan, tilt, zoom) cameras. Using these, estates can track intruders for a while (how long depending on the capabilities of the cameras and the terrain). But if the PTZs lose the intruders before the response team arrives, you are back to square one. So the question we need to ask is if there is another way to protect your perimeter, automatically differentiate between people and animals, vehicles or trees blowing in the wind, and then track real targets as they move about the estate. Fortunately, the answer is yes. Just as thermal cameras have moved from restricted military use and have been made available to the public, intelligent radar systems have also now moved into the public domain. Hi-Tech Security Solutions was able to speak to two companies that are now selling these solutions locally. The benefits of these technologies is that you can cover kilometres with a single product – as long as you have line-of-sight – and you can watch for ground movement as well as an object in the air, which is a growing concern with the easy availability of drones. These radar systems are not the ones we see on TV that show a blip every now and then. They offer full colour interfaces and include intelligent software specifically designed for the security market. Introduced into the country by Kelly McLintock from Blacklight Technology Consulting, Observation without limits (OWL) is an American company offering radar solutions for almost any situation. The company’s GroundAware Surveillance Sensor Systems are available in various options that offer surveillance distances from 10 metres to 15 km depending on the product chosen. And although it may not always be the solution estates require, the systems can be installed on vehicles or trailers and moved to areas where coverage is required. If an estate chooses the GA1360, for example, it will have a coverage in a 10 m to 1 km radius with a 360-degree field of view and a 40-degree elevation. Depending on the height of the installation, vehicles can be detected at 1 km, while a person walking can be detected and identified as human at 0,5 km, and a drone at 0,25 km. The GA9000, on the other hand, offers a range of 100 m to 15 km, a 120-degree field of view per device (three of which can be combined to create a 360-degree view), and an elevation of between 12 and 90 degrees (which must be stipulated at manufacturing). Vehicles can be detected at 10 km and walking people at 7 km. McLintock explains that OWL makes use of digital multi-beamforming S-Band radar technology designed specifically for ground and low-altitude surveillance. He says this offers reliability and accuracy, with the fewest nuisance alarms in any weather conditions. Moreover, these systems operate at a low frequency to avoid conflicts with common radio frequency (RF) systems that may potentially be used on estates and in other vertical markets. GroundAware comes with a web-based dashboard that provides an overview of the area being monitored (and it can be integrated into existing management platforms). Operators are not only provided with an overview, but can use the intelligence in the system to demarcate certain areas as restricted or open, and set rules as to what the system should do when a person or people are detected in these areas. The system is also able to differentiate between people and animals, vehicles and so forth. This means you can set the system to ignore animals (including birds flying within the elevation the system is capable of) and raise an alert when people are spotted in specific areas. It also covers the whole area simultaneously, meaning that if intruders purposely set off an alarm in one or more areas with the intention of distracting the security team while their partners break in somewhere else, operators can see the distraction and ignore it while taking action to stop the real intruders. And, of course, the radar operates in real time, allowing operators to track the intruders as they move about, keeping the responders informed. Estates with existing security systems, such as surveillance cameras can also integrate these devices into the radar solution. This means, for example, that cameras can automatically focus on the area and track the intruders, or lights can be switched on and two-way communications can also be used. McLintock adds that the radar solutions can be installed on existing infrastructures, such as rooftops, poles, walls etc., which saves costs. And since the systems are designed with no moving parts, maintenance and support issues are also minimised. Another local company offering radar solutions, manufactured in the US for the local market, is the 3DT Group of Companies. Larry Hurwitz, CEO of 3DT explains that the company also makes use of OWL, a product manufactured by Groundaware, as well as solutions for other US manufacturers. The solutions are similar to the above, but have varied ranges depending on customer requirements. Moreover, as a local company, Hurwitz adds that 3DT adds value to the products to make sure they meet the requirements of the local market, including residential estates, farms and industrial sites where monitoring large areas is a requirement. Due to the built-in management functionality the S-band radar products offer, available from a browser or integrated into your existing management system, not only can users denote certain areas as no-go areas, but can set time limits. For example, the golf course can be set as an open area from 6 am to 8 pm, after which it is a no-go area and an alarm will be raised if someone goes for a stroll or a bunch of teenagers decide to vandalise a green. Looking at a farm for example, a barn can be an open area during the day when people are working and moving around, but after hours it will be alarmed. As an example of the value-add 3DT has designed, Hurwitz points out the company’s Time-to-Target feature. This feature detects an intrusion into a monitored area, determines where the suspects are heading and will give the operators the estimated time at which they will arrive at the target (this is accomplished from the data the system provides, such as the type of intruder (i.e. human), the speed at which they are moving and their heading etc.). This allows security personnel to be directed to a location to intercept the intruders, and if there are people at the targeted location, they can be warned to vacate the area or to secure themselves until the situation is resolved. Adding alarms and zones is a simple process done with a mouse, and rules are set with a few clicks. Operators can also add their own comments to each alarm, which is recorded with the relevant incident data. All incidents are logged and easily accessible for future analysis or investigation. It should be noted that while the radar systems are able to identify what an object is and track it over long distances, they are not able to identify who the intruders are (in the case of humans). To deal with this, both McLintock and Hurwitz advise that radar is used as a layer in your security solution, backed up by, for example, PTZ cameras, in specific locations. When an intrusion occurs, these PTZs can automatically be directed towards the intrusion for a visual on who the suspects are. Unlike traditional perimeter surveillance systems, however, fewer PTZ cameras are required, positioned strategically to cover sensitive areas. Human resources costs are also reduced because the control centre operates on a black-screen basis, which means operators are alerted when an intrusion occurs and can deal with it instead of watching numerous screens all the time with limited results. 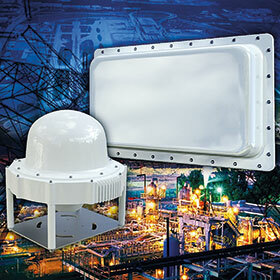 Cost is always a factor in the security world and these radar solutions are not cheap when considered as a single purchase. It should be noted that, considering the quick set-up and configuration times, as well as the large areas covered, the total cost of ownership (TCO) over three to five years could be as little as one-third of the cost of even a cheap surveillance solution covering the same area.